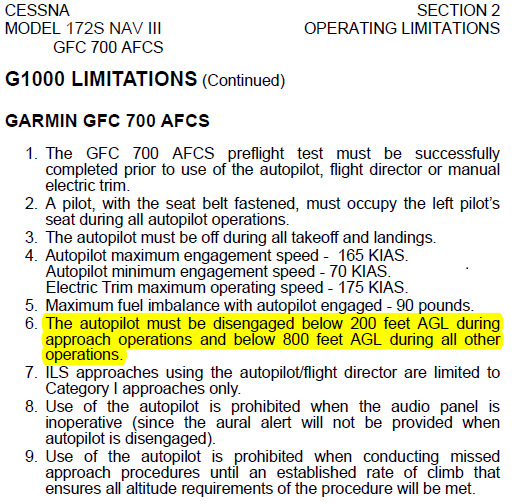 What are the Autopilot Minimums for a C-172 G1000? Typically, the aircraft flight manual will identify this. 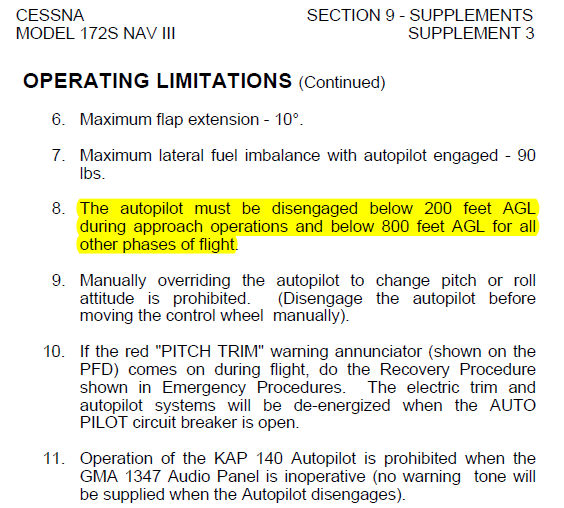 In your particular case (Cessna 172 G1000), it is 200 feet AGL for all approach types. The C-172 can be fitted with either a Garmin GFC 700, or a Bendix/King KAP 140. Not the answer you're looking for? Browse other questions tagged general-aviation autopilot cessna-172 g1000 or ask your own question. When do pilots disconnect the autopilot on an ILS approach? What are the differences between a GPS coupled autopilot and a GPSS autopilot? Why does the CF-100 autopilot have a toggle switch labeled 'ATTACK'? When is the autopilot engaged and disengaged? Why is an auditory alarm necessary when the autopilot disengages? What are the restrictions preventing more intelligent autopilot systems? What are the considerations for coding the GPS before engine start without external power? Can you fly the plane manually without disengaging autopilot?